There is often a long interval between temporary and definitive filling after endodontic treatment in primary teeth. In pediatric dental treatment, the temporary restorative material should be chosen with an even greater care, to avoid delays in treatment, repeat procedures, and possible physical and psychological stresses for the child. Due to a lack of papers published on primary teeth, the purpose of the present in vitro study was to compare the coronal microleakage of the following temporary restorative materials used between sessions of endodontic treatment in primary teeth: Cimpat Branco ® (Septodont, Lancaster, USA), Bioplic ® (Biodinβmica, Ibiporγ, Paranα, Brazil) and Maxxion R ® glass ionomer cement (FGM, Joinville, Santa Catarina, Brazil), using Z350 ® composite resin (3M, St. Paul, Minnesota, USA) as a control. This study received approval from the research ethics committee of the Universidade Federal de Santa Catarina, Brazil (process n. 093/08). The sample consisted of 40 primary canines with crown intact, extracted for reasons not related to this study. The teeth had been stored in a 10% formalin solution not exceeding 6 months. The laboratory stages were carried out by a single calibrated investigator. Since the selected crown had different sizes, standardized class V cavities were prepared (3 mm in length × 3 mm in width × 1.5 mm in depth), then washed and dried. Number-2 spherical drill burs (S.S. White®, New Jersey, USA) were used at high speed. After the cavities were performed, the teeth were washed in water, dried, and randomly divided into four groups (n = 10): Group 1 - Cimpat Branco ® , Group 2 - Bioplic ® , Group 3 - Maxxion R ® glass ionomer cement, and Group 4 - Z350 ® resin composite. All materials were used following the manufacturer's instructions. The filled specimens were stored under 100% humidity at 37°C for 24 h, followed by 500 of 30-second cycles; thermal cycling at temperatures of 5°C and 55°C. The surface of the teeth was then sealed with Araldite ® (Brascola Ltda, Joinville, Brazil) on the apical portion and two coats of nail polish over the entire tooth, leaving a margin of 1 mm around the filling. The teeth were immersed in a 0.5% solution of basic fuchsin solution and transferred to an incubator at 37°C for 24 h. Finally, the specimens were rinsed in running water to remove the excess stain from the surface, dried, and stored once again in an oven. The teeth were split along their long axis in the vestibulolingual direction with a double-faced diamond disc (KG Sorensen ® , Sγo Paulo, Brazil) and the tooth-restorative material interface was photographed with a Canon EOS Digital XTI camera (Canon U.S.A. Inc ® , New York, USA). The percentage microleakage (extent of stained surface/total surface of the restorative material) was analyzed by a previously calibrated single examiner and calculated using ImageJ program (Microsoft Corp ® , Washington, Redmond, USA) [Figure 1]. Microleakage was determined from the penetration of dye at the tooth-filling interface in the incisal and cervical segments. The mean percentage of microleakage was calculated for each group for comparison purposes. Statistical analysis of the data consisted of the analysis of variance (ANOVA) F-test and Bonferroni's t-test, with the level of significance set at 5%. The intraclass correlation coefficient (ICC) revealed satisfactory, reproducible results (ICC > 0.4) [Table 1]. The ANOVA F-test revealed statistically significant differences between groups. With the results of the Bonferroni's t-test, considering a level of significance of 5%, revealed Groups 1 and 4 had significantly lower mean percentages of leakage in comparison to Groups 2 and 3 [Table 2]. The material that offered the lowest percentage of marginal leakage was Z350 ® composite resin (Group 4), followed by Cimpat Branco ® (Group 1), Bioplic ® (Group 2) and Maxxion R ® glass ionomer cement (Group 3) [Figure 2]. The present study examined the microleakage of the following currently available temporary filling materials on primary teeth: Cimpat Branco ® , Bioplic ® and Maxxion R ® glass ionomer cement. Composite resin (Z 350 ® ) was used as a control. Glass ionomer cement is an acid/base reaction in powder and liquid form that contracts on polymerization. As it is mixed by the dentist, inconsistencies in the mixture may directly affect the properties of the material. It is important to highlight the fact that due to the lack of papers published on primary teeth, the data in the literature come mainly from studies performed on permanent teeth, which could result in significant differences from the findings of the present study. Moreover, the methodology employed in the present study differs from the other investigations discussed here, in terms of the assessment of the depth of the microleakage. In most studies, the authors assessed microleakage within the pulp chamber. ,,, In the present study, the assessment was more precise, as it considered the tooth-restoration interface. Despite the fact that Cimpat Branco ® had the lowest percentage of microleakage among the temporary restorative materials tested, it would be premature to suggest that it is the best material and further studies should be performed on primary teeth to test other properties of this type of material. Z350 ® composite resin and Cimpat Branco ® had lower percentages of microleakage in comparison to Bioplic ® and Maxxion R ® glass ionomer cement. Among the temporary restorative materials tested, Cimpat Branco ® had the lowest percentage of microleakage. Further studies are needed, especially on primary teeth, to further confirm the identity of the most adequate temporary filling material for use between endodontic treatment sessions. In addition to providing an adequate marginal seal, such material should exhibit biocompatibility with oral tissues, resistance to chewing forces, adequate dimensional stability, and satisfactory interaction with the filling material between endodontic sessions. This investigation was supported in part by the National Council for Scientific and Technological Development (CNPq). No potential conflicts of interest relevant to this article are reported. 1. Cruz EV, Shigetani Y, Ishikawa K, Kota K, Iwaku M, Goodis HE. A laboratory study of coronal microleakage using four temporary restorative materials. Int Endod J 2002;35:315-20. 2. Soares IJ, Goldberg F. Endodontics: Technique and fundamentals. In: Porto A, editor. 1 st ed. Artmed; 2002, p. 524. 3. Fachin EV, Perondi M, Grecca FS. Comparison of sealing ability of different temporary restorative materials. RPG Rev Postgrad 2007;13:292-8. 4. Koagel SO, Mines P, Apicella M, Sweet M. In vitro study to compare the coronal microleakage of Tempit UltraF, Tempit, IRM, and Cavit by using the fluid transport model. J Endod 2008;34:442-4. 5. Ghisi AC, Pacheco JF. In vitro study of coronal microleakage of temporary restorative materials used in endodontics. Rev Odonto Ciênc 2002;17:62-71. 6. Silveira GA, Nunes E, Silveira FF. In vitro evaluation of microleakage of three temporary sealing materials at different times. Pesqui Odontol Bras 2003;17:216. 7. Lenzi TL, Guglielmi Cde A, Arana-Chavez VE, Raggio DP. Tubule density and diameter in coronal dentin from primary and permanent human teeth. Microsc Microanal 2013;19:1445-9. 8. Senawongse P, Harnirattisai C, Shimada Y, Tagami J. Effective bond strength of current adhesive systems on deciduous and permanent dentin. Oper Dent 2004;29:196-202. 9. Uekusa S, Yamaguchi K, Miyazaki M, Tsubota K, Kurokawa H, Hosoya Y. Bonding efficacy of single-step self-etch systems to sound primary and permanent tooth dentin. Oper Dent 2006;31:569-76. 10. Zaia AA, Nakagawa R, De Quadros I, Gomes BP, Ferraz CC, Teixeira FB, et al. An in vitro evaluation of four materials as barriers to coronal microleakage in root-filled teeth. Int Endod J 2002;35:729-34. 11. Pai SF, Yang SF, Sue WL, Chueh LH, Rivera EM. Microleakage between endodontic temporary restorative materials placed at different times. J Endod 1999;25:453-6. 12. Shinohara AL, Oliveira EC, Duarte MA. In vitro evaluation of microleakage of temporary sealing materials subjected to thermal cycling. JBE: Jornal Brasileiro de Endodontia 2004;5:79-85. 13. Marques MC, Paiva TP, Soares S, Aguiar CM. Evaluation of the marginal leakage in temporary restored materials - an in vitro study. Pesqui Bras Odontopediatria Clín Integr 2005;5:47-52. 14. Oliveira EC, Sganzella PE. Evaluation in vitro of marginal microleakage of the temporary sealing materials after thermocycling. Rev Fac Odontol Lins 2005;17:33-8. 15. 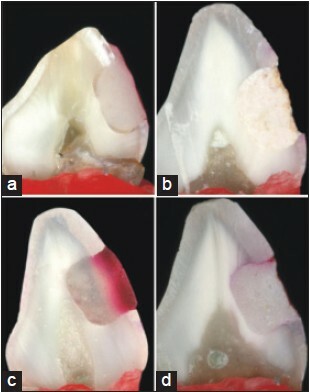 Odabas ME, Tulunoglu O, Ozalp SO, Bodur H. Microleakage of different temporary filling materials in primary teeth. J Clin Pediatr Dent 2009;34:157-60. 16. Bussadori SK, Muench A. Microleakage in primary teeth as a function of restorative materials and acid etching. Rev Odontol Univ São Paulo 1999;13:369-73. 17. Ramos AA, Galan Jr J. Marginal leakage of temporary restorative materials. Rev Gauch Odontol 2004;52:305-8.